Sun Crystals All-Natural Sweetener is nature saying, yes, you can have it all. Enjoy the perfect blend of naturally sweet stevia and pure cane sugar, nourished by the sun to be deliciously sweet and naturally low in calories. 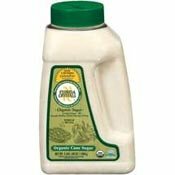 My sister and I love everything about Florida Crystals Organic Sugar. The taste the texture, the color and of course that it's organic. We use it in coffee, oatmeal and some baked goods. And when we catch it on sale AND have a coupon to use too, we are thrilled!